At first, this didn’t make sense. Tron (TRX) was a highly controversial project that had plagiarized large portions of its whitepaper as well as its code, as we discovered. To say the EOS (EOS) launch was messy would be a compliment. We reviewed Ontology (ONT) and VeChain (VEN/VET/VTHO) and let’s just say they weren’t our favorite projects. What was clear from the data was that mainnet launches, no matter how controversial the project or messy the launch, generated significant amounts of outperformance or alpha (i.e. excess returns above a benchmark). What is a mainnet launch? It’s when a placeholder token, like an ERC20 token on Ethereum or NEP5 token on NEO, is exchanged for a new token on a standalone network that usually initiates the promised functionality of the project, like the ability to execute smart contracts. It’s called a main network or mainnet if you prefer the unapproachable jargon of the industry. Not all mainnets currently enable the robust or even basic features of a promised project. You can’t engage on any level of token interoperability on ICON (ICX) or Aion (AION) or execute smart contracts on Cardano (ADA) today. That doesn’t mean active crypto managers can’t generate alpha though. Our analysis of all the mainnet launches that have occurred in 2018 showed meaningful average and median outperformance versus benchmark digital assets like Bitcoin as well as an index of small cap digital assets, the Bitwise 70 index. What does this look like graphically? Below is the cumulative alpha (outperformance) of Ardor (ARDR) vs Bitcoin (BTC) and the Bitwise 70 before and after their mainnet launch at time 0. 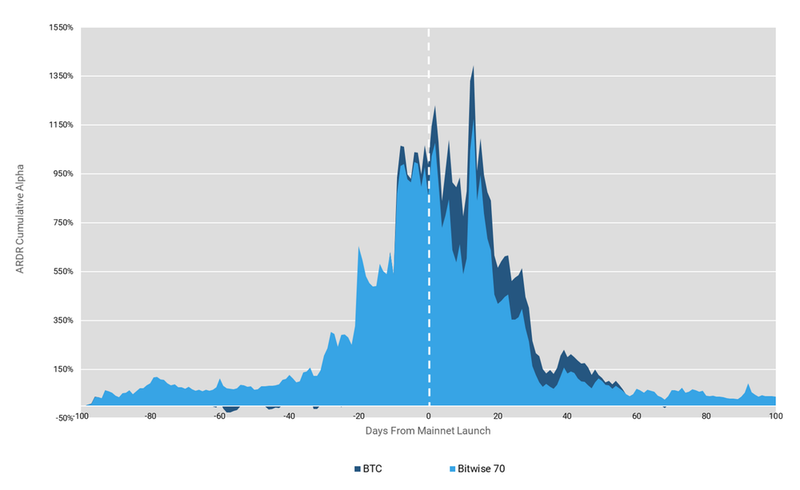 Said another way, the following chart starts 100 days (t = -100) before the mainnet launch event (t = 0) and looks at ARDR’s daily relative price performance vs BTC and keeps a running tally that we call cumulative alpha. It’s not reasonable to expect to see every mainnet launch to look this pretty but this broad trend held across the launches we examined. There are some important nuances active managers should be aware related to timing and underlying market conditions, however. With nearly 2,000 public tokens trading 24/7 how do you keep up with potentially market-moving events like mainnet launches? We track of all the important events for crypto managers as part of our new Crypto Catalyst Calendar. Of course, these events include mainnet launches, but it also includes hard forks, soft forks, airdrops, legal and regulatory events as well as anything else that might affect the price of a digital asset. To find out how to get access to the product beta ahead of launch, please fill out a request for information form here.